People who regularly drink alcohol are probably unaware that they are risking the health of their throat and are leaving themselves at risk of developing many nasty illnesses and complaints. How Might Alcohol Affect My Throat? Studies examining the role of alcohol and diseases of the head and neck, including the throat, have been undertaken for many years and experts agree that there are many risks associated with drinking alcohol. Cancer development is now known to be a significant risk to those who drink large amounts of alcohol, and if this is coupled with tobacco smoking, the chances are even higher. Drinking large amounts of alcohol causes changes in the functions of certain parts of the anatomy in the mouth and throat and may affect the salivary glands, the membranes and the normal mucosa to name a few.Less serious effects on the throat include drinking alcohol when you have a sore throat. Dryness of the throat is very common when a throat infection is present and many people turn to alcohol to lessen the discomfort or to help them sleep. In fact the reverse effect is likely as the alcohol will dry the tissues further and leave the person in more discomfort than before. If you have a known throat infection, or indeed any other form of infection and are taking anti-biotics, it is very important that you don’t drink alcohol while you finish your course of treatment. Some types of anti-biotic will make you very ill if alcohol is present in your system so it should be avoided at all costs. Anyone who drinks large amounts of alcohol combined with smoking tobacco products is particularly at risk of damage.Smoking is now known by everyone to be damaging to health but coupling this with large amounts of alcohol significantly raises the chances of developing something nasty. Giving up smoking is often the single most advantageous act that a person can do to protect their health. 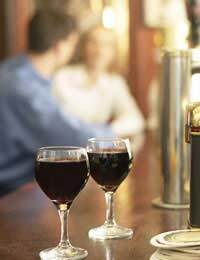 Drinking within the recommended limits is not going to harm you and can in fact help improve health for some people, so enjoying a glass of wine or two once or twice a week is not going to harm you. The best way to protect the health of not just your throat, but many other parts of the body is to keep within the recommended limits of safe drinking. Don’t smoke and avoid smoky atmospheres to prevent further damage. If you really must have a little more than the recommended limits of alcohol, make sure you don’t do this regularly and drink plenty of water before drinking, after drinking and alternate an alcoholic drink with a soft drink. Medical research has now confirmed that those who smoke and drink alcohol regularly are the most at risk of developing problems of the mouth and throat with cancer being high on the list. By having an awareness of this fact it is hoped that people will be sensible regarding the amount of alcohol they consume and protect their health in the long term. Thank you for the information! I appreciate it (:: Very helpful.